Spring is springing and lovely flowers that slept through the cold winter have begun to come out of hiding. Among them is a favourite known for its velvety petals and variety of gorgeous hues. A bed of tulips can be quite an attraction. For three weekends in May, hundreds of thousands of visitors flock to Ottawa, Ontario for the annual Canadian Tulip Festival. The nation's capital blooms with over a million of these colourful springtime flowers in displays planted throughout the city. One of the largest is the 300,000 planted along the Rideau Canal. The idea of this floral festival took root decades ago beginning with the start of a beautiful friendship between two countries on either side of the Atlantic Ocean. During the German occupation of the Netherlands in the Second World War, Canada sheltered Princess Juliana and her two daughters. The most noteworthy event during their time overseas was the birth of the princess's daughter. Canada declared the hospital's maternity ward a temporary part of international territory so the tiny princess would be a Dutch citizen. 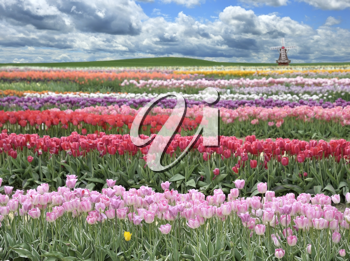 As a show of gratitude the Dutch royal family sent 100,000 tulip bulbs to Ottawa, while Princess Juliana sent another 20,500 for a display at the hospital. Another annual gift of 10,000 bulbs was promised. With the profusion of these vibrant blooms, it wasn't long before people began to take notice and in 1953 the Ottawa Board of Trade organized the first festival.